We arrive at another post searching for mobile games to help me scratch the 40K itch while I’m on the road (which is often). 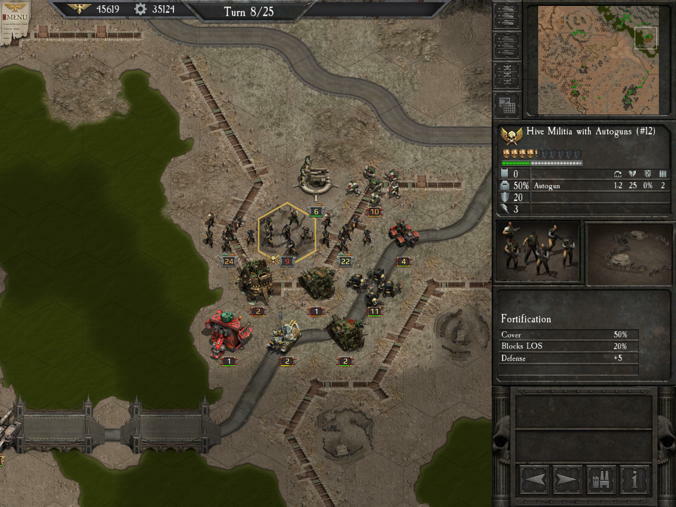 Previously, I’ve reviewed the excellent Deathwatch, essentially Warhammer Quest but for 40K, and the somewhat more middling Carnage, a side-scroller with a 40K veneer. Now lets take a look at a game I’ve been looking forward to for a long time, Warhammer 40K: Armageddon, or as I’ll be calling it for the rest of the post, Armageddon. First, a note on price. Armageddon is available on the iTunes App Store for $19.99. While steep for a mobile game, this is considerably less expensive than the PC version on Steam for $39.99. My review should be taken in the context of this lower price. 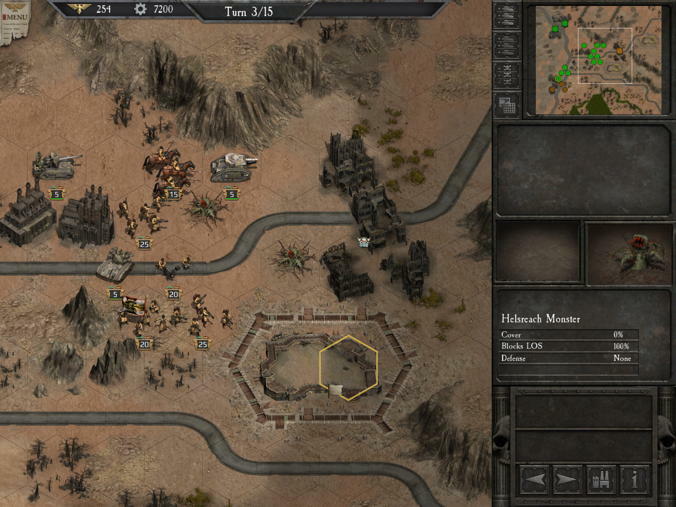 Fans of the classic PC strategy game Panzer General will be right at home playing Armageddon. Indeed, when I first heard about it, it was from someone dismissing the game as “Just a 40K reskin of Panzer General”. Given the hours upon hours I played the older game, this struck me as more of a feature than a bug. 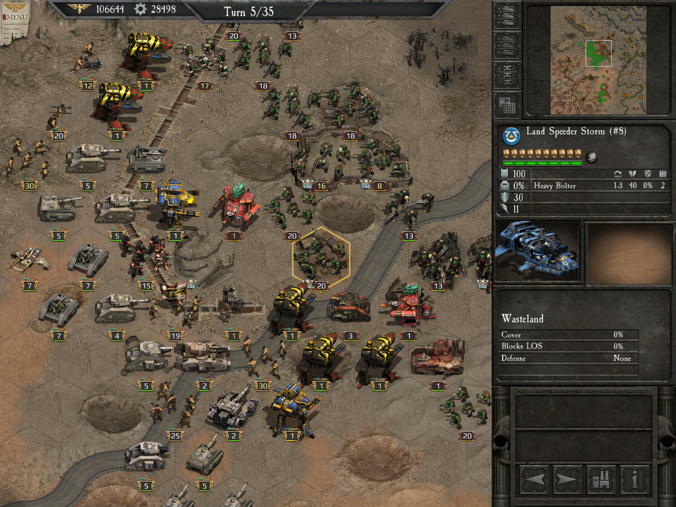 Essentially, the game is a hex-and-counter strategy game set in the 2nd War for Armageddon, and is very much a strategic level game. 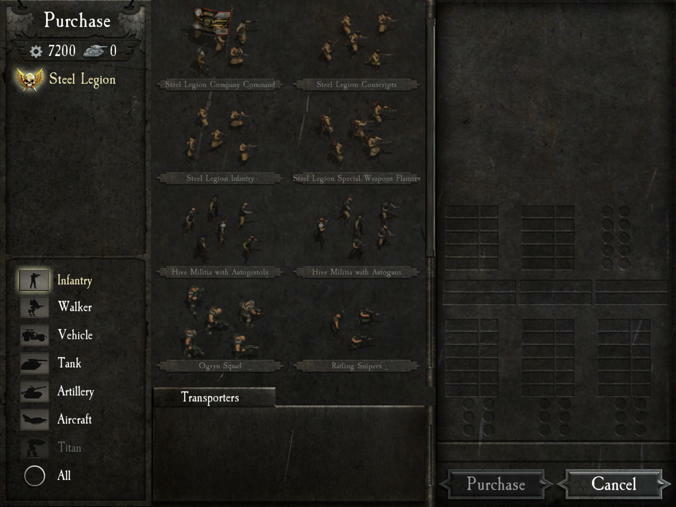 You start commanding a relatively small detachment of Steel Legion troops, but at the end of the game it’s much more like a full regiment, plus an attached demi-company of Space Marines, plus a Titan maniple. 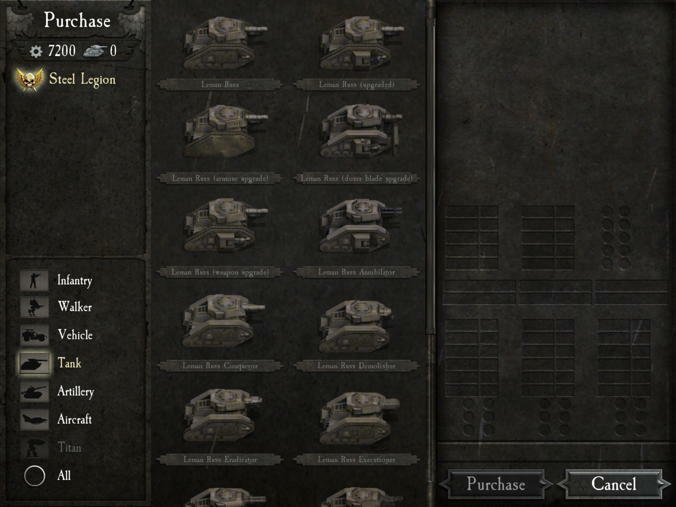 You play the roll of a Imperial Guard commander, playing through a linked series of scenarios that take you through the entire war from beginning to end, placing you at some of the pivotal battles of the war, and allowing your forces to gain experience, get upgraded, etc. Storywise, the game is…pretty decent. The developer, Slitherine, does what they can within a framework where the events are already set. No matter what you do, you won’t kill Ghazghkull. Yarrick will always be the “Old Man of Armageddon”. But you’re not just meant to carry water – over the course of the campaign it becomes clear that you’re regarded as an indispensable field commander. Beyond that, the characters feel like I pictured them feeling. Yarrick is tough but fair. Your random Commissar is a pompous blowhard. The Blood Angels are noble but somewhat above the fray, while the Salamanders come off as considerably more concerned for the welfare of their mortal allies. The Inquisition is, as always, infuriatingly mysterious. So far, we’re off to a good start. The gameplay is solid, though it’s hardly revolutionary, and definitely doesn’t feel considerably more advanced than it’s spiritual predecessors. Most missions boil down to capturing some number of victory hexes, or making sure the victory hexes you control stay that way. Occasionally other objectives, like keeping some civilians alive, or making it to a particular point, are thrown in for flavor. The scenarios are short enough to make sense on a mobile platform, but not so short that they’re well suited for a short commute. An abandoned city and trench line. What could possibly go wrong? Gasmasks and Lasguns, as far as the eye can see. A fan of 40K will find that most of these units perform like you’d expect them to. Leman Russ Vanquishers are deadly against vehicles, but somewhat wasted against Gretchen. Heavy Weapon support squads, on the other hand, will do a number on light vehicles and infantry both. They have their obvious weaknesses as well – you don’t want a Wyvern caught out in the open by a group of Mega-armored Nobz. Recon units, like Rough Riders, are useful but apt to get massacred when they run into the enemy’s main front. Generally, Imperial Guard units have good tanks, and their infantry, while mediocre, can out last their Ork attackers via reinforcements and keeping their morale up. Space Marine units are considerably tougher, though less well suited to be bullet sponges. There are a few standouts here, and a few disappointments. Salamanders are outstanding, the combination of mobility and the autocannon/heavy bolter combination meaning they’re useful against all but the worst the Orks can throw at you. Basilisks similarly are outstanding – especially as a number of the missions rely on you either advancing through, or defending, bottlenecks. The basic strategy of sending a tough unit through to take the hits and scout while a Basilisk or two pounds away at the enemy is one that got me through most of the game. On the other side are the superheavy tanks. While they play like they’re supposed to, they have an awkward place in the game. They’re best on defense, where their mobility is less of a problem, but by the time they appear in game and you have the resources to buy them, the war has largely shifted to taking back the planet. They’re outstanding for the first few turns, but after your initial breakout, they’ll be outpaced by everything else in your army. What’s worse, following shortly on their heels come the Titans, which are better in every respect, including mobility. It’s somewhat disappointing, given how iconic they are. While enjoyable, and definitely capable of scratching the 40K itch on a cross-country flight, the gameplay does have some drawbacks. As mentioned, it relies overmuch on choke points, and the AI isn’t particularly clever. This means much of the difficulty comes from advancing into prepared positions and the inevitable casualties that come from that, which while very Imperial Guard-y does become somewhat predictable. The AI also isn’t terribly clever – it can be lured into traps, and will often give you time to regroup, reinforce, etc. when a human opponent would press their advantage. This is especially true if you’re not in line of site – an intelligent opponent would know you’re “out there somewhere”, while the AI sits idle. Similarly, as with the old Panzer General games, the campaign is susceptible to runaway victories. Between experienced units being absolutely deadly, not having to spend as many resources on replacements, and starting to accumulate upper-tier units like Reaver Titans, things start to turn. 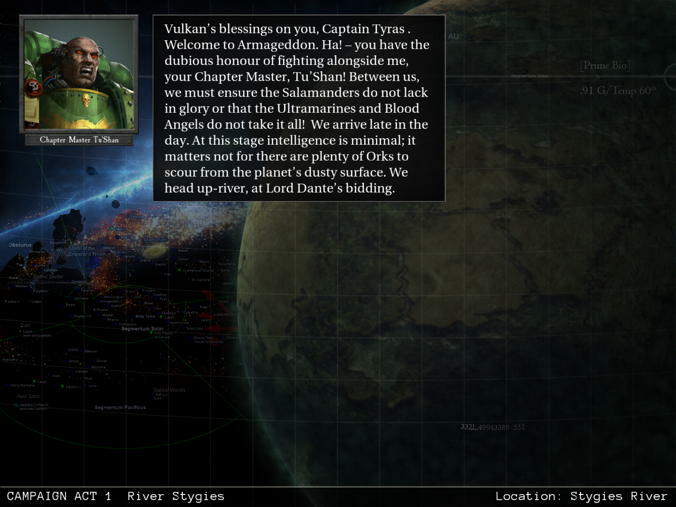 By the way, at one point in the campaign you get Captain Tycho. Do not let him die. There is basically no situation an ultra-experienced Space Marine command squad cannot cut their way out of. It’s theoretically possible, for example, to have phased out nearly everything in favor of Titans, though that’s less than inspiring in terms of gameplay. In contrast to many iOS games, Armageddon doesn’t require an internet connection to function. Frequent readers will know how much this matters to me – I want to be able to use the game on an airplane, or the subway, or the DMV waiting room. If I can only play it where I have reliable internet, I might as well be painting actual minis. The game also features in-app purchases at a somewhat pricey $4.99 each (or $9.99 for all of them), but they’re entirely optional. They each unlock a Chapter-specific Space Marine campaign. I’d suggest holding off until you’re finished with the main campaign. There’s enough Space Marine action in it to figure out if you enjoy the way they play before you spend real cash getting more levels. Overall, Armageddon was fun, engaging, and felt like 40K. For long time fans of the hex-and-counter genre, or looking for more sweeping action than Deathwatch delivers, Armageddon might be just the thing. The AI can be a little dumb at times, and the scenarios reduce to “Divide your forces in two and advance across the bridge”, it still provided many hours of entertainment. Tellingly, it’s been one of the few games to pry me away from Deathwatch, and I find it easier to play casually.